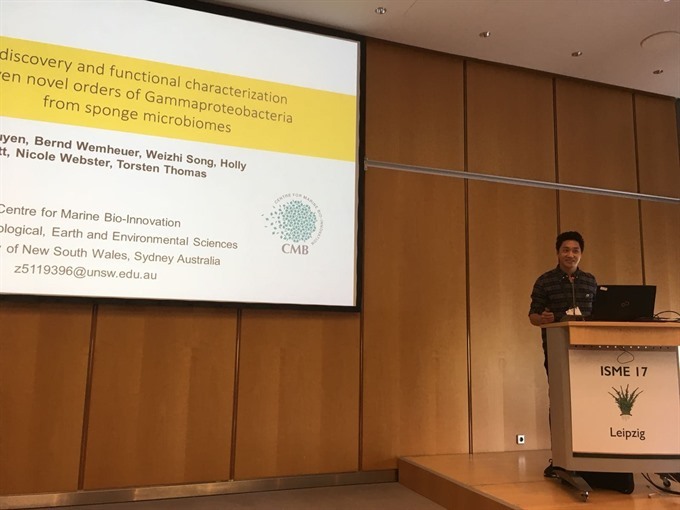 At the 17th International Symposium on Microbial Ecology (ISME17) held in Germany in August, Nguyễn Việt Hùng was the only Vietnamese speaker invited to present his work in front of over 2,000 renowned scientists from over 60 countries. Hùng, a Vietnamese postgraduate at the University of New South Wales (UNSW), Australia, is also responsible for discovering eight new species of bacteria. His presentation on his new findings received rave responses from the attendees. 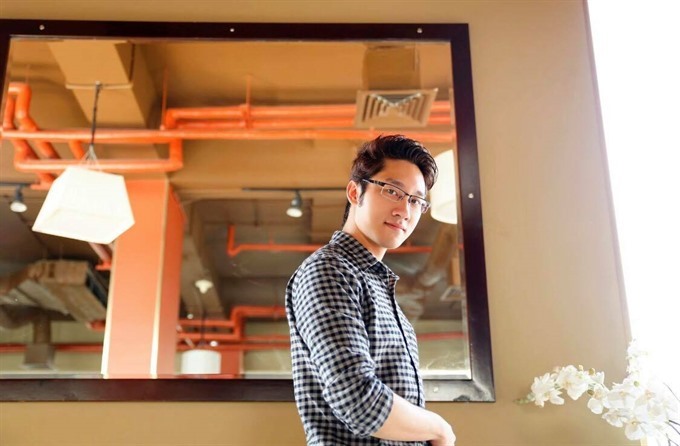 Born into a family in which both grandfather and father were researchers, Hùng became interested in reading books and research from a young age. When he was small, he adored Pokémon, a fictional character featured in Japan’s Pokémon Adventures Manga, so much so that he memorised all the features of 15 kinds of Pokemon and even received a US$200 award for an essay about the characters submitted to a writing contest in the US. “I wanted to do something exciting, something that would yield results quickly, something that I could clearly visualise, and work towards with evenly spaced, short milestones. I found microbiology to be the case,” Hùng says. “Microorganisms play such a major role in everything. What I was searching for was in fact extremely relevant and potentially important, not just on a small scale but globally. That is why I love microbiology,” he adds. Thanks to his passion for microbiology, Hùng won full Ph.D scholarships to four top universities in Australia – the University of Sydney, the University of Melbourne, Macquarie University and UNSW. He chose the latter to follow microbiology. At present, Hùng is both a postgraduate and lecturer at UNSW, majoring in Biomathematics, Bioinformatics and Computational Biology. The 28-year-old scientist spends around nine hours a day on research. Hùng discovered eight new microbial species when his research group from the Centre for Marine Bio-Innovation at UNSW, headed by Professor Torsten Thomas, was trialing a new method of genome reconstruction from shotgun sequenced metagenomic data. The idea was to bypass the necessity for culturing completely, which had hampered the ability to screen for novel microbial species from environmental samples. “The complication is that DNA sequenced through shotgun technology is highly fragmented, and thus the issue was whether we could robustly reconstruct the original genomes from all these small fragments of DNA. "It turned out that we could, and I obtained 126 metagenome-assembled genomes from two sponge samples, from which I screened for gammaproteobacterial genomes and characterised/classified them,” Hùng recalls. These microorganisms could bring practical benefits to the environment. “In aquaculture, a particular region keeps on seeing mass die-offs due to unknown diseases. By applying this metagenomics pipeline, we can determine what microorganisms are living in that environment, and also what harmful genes may be present in those genomes, to potentially determine the cause of the disease,” he says. It can also be applied to problems at water treatment plants. With this method, what microorganisms in water treatment plants that are successful can be determined and transplanted to other plants. But the amazing thing is that the protocol also allows an estimation of the relative abundance of the different microorganisms in the environment, and thus when the microorganisms are transplanted, the proportions can also be set from the very beginning to ensure a higher chance of success, Hùng adds. His discoveries have been well received, the first indication of which was at his PhD review, where reviewers were all thrilled by his research, including his supervisor. The real mark of its potential; however, came when he was accepted to the ISME17 as a speaker. Hùng was amongst the few PhD students who were given the chance to speak at the event. Research by other Ph.D students was limited to poster presentations. Also at the event and the third International Symposium on Sponge Microbiology, his research was well received. “Many pictures were taken of my slides, and after both talks, I received a lot of interest from other researchers who came up to me to ask more about my research,” Hùng says. To him, representing Việt Nam as one of the speakers at ISME17 and being able to come on stage and present to so many top researchers from across the world was both an honour and thrilling experience. However, at the same time, Hùng felt a tinge of sadness, as he knows that Vietnamese researchers conduct some amazing research but are not invited to present their findings at events such as ISME17. “I met quite a few Vietnamese researchers at the symposium and their research really do have an impact. I hope that through this, Vietnamese researchers will be inspired to make their mark as well,” he continues. After the discovery of the eight new bacterial species, the young scientist has discovered seven novel acidmicrobiial species and is currently in the process of classifying and characterising them. After that, he plans to examine the horizontal genetic transfer events between such microorganisms to determine if there is a pattern to these microorganisms’ symbiotic relationship with their host. He also plans to take his research further after completing his Ph.D, perhaps in a more commercial direction. “Otherwise, I plan to delve further into my research, in which case I plan to head to the US. There are many research institutes that are performing some truly amazing, groundbreaking research, and I want to test my skills at such places,” Hùng says. Besides hours spent on his great passion, the young scientist is also an active person with various hobbies, particularly community involvement; which might explain why he is currently the president of the Society for Vietnamese International Students at UNSW. “I also like to play sports, specifically volleyball, and travel and explore new places, and last but not least, aquarium-keeping.